Dr. Aaron Thode and his graduate student Ludovic Tenorio from Scripps Institution of Oceanography have documented underwater sounds and gray whale vocalizations in Laguna San Ignacio since 2005. 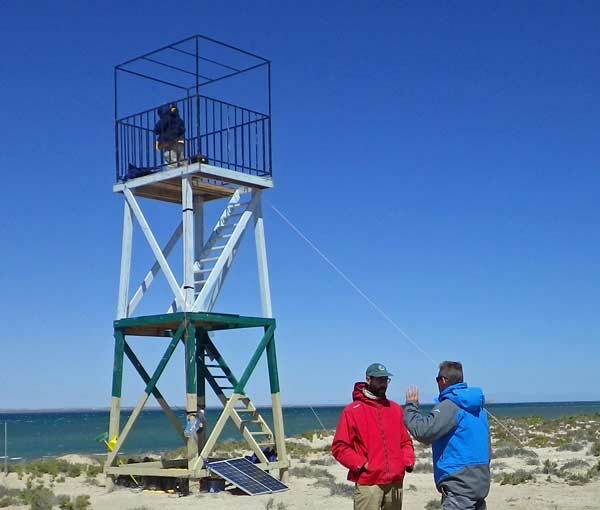 In 2018 Aaron and Ludovic will continue to measure and document the ambient noise properties and levels of whale vocal activity in the lagoon, and they will initiate new research to compare gray whale vocalizations and behavior in “real time.” Working from a 5-m tall observation tower, provided by Kuyimá Eco-Turismo, they will document the surface behavior of gray whale groups and their interactions, particularly those of mothers and calves, while simultaneously recording the whales’ calls underwater. The goal will be to correlate specific gray whale behavior with calls of the whales, and develop an understanding the whales use of various vocalizations to communicate.